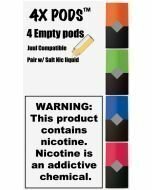 Enjoy your new 4x Juul Compatible Pod with your favorite salt nicotine ejuice. Fill the pod with any salt nicotine e-liquids from the side approx 0.7ml (Do Not Overfill). Place the rubber piece in the center, Place the cap over the pod and click it.